Continuing the "Foundation" series, MAC Studio Finish Powder Plus Foundation does exactly what it says on the tin. Per MAC, it combines coverage and ease of application as both a foundation and a finishing powder in one. Using this as a foundation, medium coverage is usual. It's not possible to sheer this out particularly, as it's designed to be used dry. It is possible to achieve full-coverage with this on its own, but it can look a little chalky. Personally, when I want full coverage, I generally use this over a liquid foundation to powder it down and give a more long lasting, heavier cover. It's also brilliant for "later-on touch ups"in lieu of foundation, powder and concealer. The powder pigments in this create a matte velvet texture, but it's a very dead matte. In general, I spritz this with MAC Fix+ after I apply to help take the dry look off my face, it also helps to meld the foundation into my skin. This wears for a standard seven-eight hours, but it's easy to top-up later on (it's great to use for touch-ups). It's great to use for a really quick makeup in the morning when you're in a hurry, sprayed with some MAC Fix+ afterwards, as mentioned. 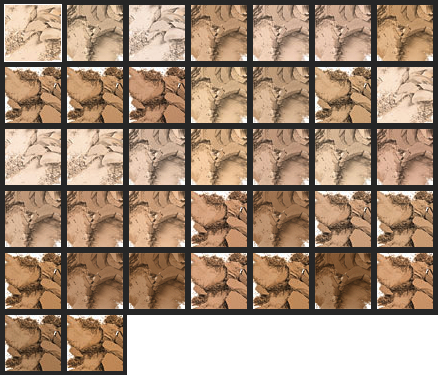 This comes in a LOT of (thirty seven) shades, organised into C, N, NC and NW undertones, and in particular there are bunch of really pale colours, which not all of MAC foundations cater for. As mentioned, this is designed to be used dry. It doesn't particularly work with a sponge (wet or dry). Due to the nature of the foundation (powder-based compact), fingers don't really work. For me, it works best with a dense buffing brush (I also use my Shiseido foundation brush with this foundation). As a powder, the dense applicator sponge that comes with it (if it's for applying on yourself) is good, as is a standard powder brush or buffing brush. As a touch-up concealer, I like to use this with my Laura Mercier Camouflage Powder brush. 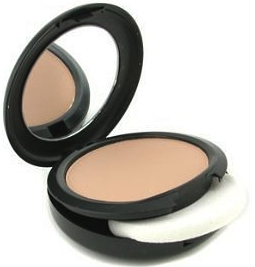 This is a very heavily powder-based compact foundation (as suggested by the name!). It contains silica, talc, silicones, titanium dioxide. This is a dry, and drying foundation/powder. It's really not great on particularly dry skin, as it can appear very patchy (or develop dry patches) if your skin is not normal/combination. It's not bad on oilier skins, but for very oily skins I find it tends to break up on the skin after some wear. The price is in-or-around €28-€30 as I recall. Given that it contains titanium dioxide, it can flashback with a slight greenish cast - need to watch use of this for flash photography.